Regardless of age, traveling is a wonderful experience. While seniors should not hesitate in embarking on an exciting travel adventure, there are certain things that seniors do have to be mindful of when they are traveling. Seniors (or anyone) with medical conditions will have to pay particular attention to their health to ensure that they can completely enjoy their travel experience. We hope these few tips will make your next trip the best yet! Jet lag affects even the hardiest of travelers. Its effects can include increased fatigue, indigestion, temporary insomnia, and irritability. For seniors who are easily tired, jet lag can be an even bigger concern. For this reason, it is highly recommended to reserve a day to do nothing and simply rest when traveling into a different time zone. Overexertion on the first day could exhaust you for the remainder of your trip, so it is best to adjust to a new time zone first. Deep Vein Thrombosis (DVT) is a blood clot that occurs in deep veins, usually in the legs. Seniors are particularly susceptible to forming these blood clots on long haul flights or after long periods of staying still. There are a number of measures that one can take to prevent this occurrence. First, it is recommended to wear loose, comfortable clothing during the flight and to drink water frequently to stay hydrated and to ensure proper circulation. As tempting as it might be to help yourself to a Bloody Mary or two, it is advisable to refrain from alcohol consumption during the flight because unless one drinks enough water to compensate, alcohol leads to dehydration. Take advantage of the aisles and make an effort to walk around when the opportunity presents itself to stimulate a healthy blood flow. If one is in danger of or has a history of DVT, there are blood thinning medications available and compression stockings to help with circulation. Please consult a doctor before taking any medications and for accurate medical advice. While traveling is an extremely rewarding experience, it can also be an exhausting one. Seniors should think about how much they can do comfortably in a day. Depending on one’s physical condition, planning half day of trekking and the other half for relaxation or interspersing a full day of activity with adequate rest is a much better way to travel than committing to an extended, strenuous hike up a mountain that may weaken an individual. Planning activities around one’s healthy and physical conditions will result in a far more pleasant travel experience. No matter your age, no one should consider an individual “too old to travel”. 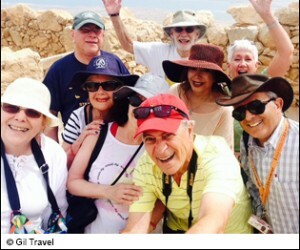 Simply by taking a few precautions, travel can be as exciting, fun, adventurous and rewarding for seniors as it is for teenagers on a Gap Year. Contact Gil Travel with any questions or concerns, or leave a comment below.